This rare collection of 126 "builder portraits" of American locomotives offers exciting images that chronicle the momentous rise of steam locomotive power in America. Builder portraits are especially prized by railway historians because they are the exacting official photographs of new models taken before repairs, alterations, and weathering altered their original appearance. The builder portraits reprinted here were selected from the William A. Rogers collection, a priceless archive of images documenting the history of American steam locomotion from the pre–Civil War era to the mid-20th century. 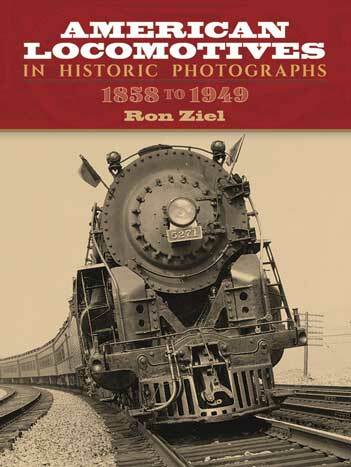 While the accent in this book is on the oldest and rarest photographs in the Rogers collection, many modern portraits are included as well to demonstrate how highly developed the American steam locomotive had become before the advent of dieselization. Among the engines depicted are the España, a diminutive model built for the Spanish government in 1858; engine # 216 of the Pennsylvania Railroad, a "fearsome apparition of Gothic character" built in 1861; the Chimbote Emilia, an inspection engine built for railroad company officials in 1868 that is considered a masterpiece of the engine builder's art; and a Union Pacific 1940s' "Big Boy," the largest and heaviest type of steam locomotive ever built.